Showcasing the distinctive styling of the Sheffield line from Wyndham Collection, this transitional Bathroom Linen Storage Tower requires just minimal assembly and makes a perfect fit for any bathroom design. A glass paneled door provides handy storage for towels, perfumes and any other items you'd like to keep visible, while four drawers keep bath essentials and clutter out of sight. Tall, slim and efficient, this space-saving tower offers a small footprint and is easy to place anywhere with its freestanding design. White finish linen tower with the reminiscent of a Swiss grandfather clock and crafted with the same meticulous attention to detail. This linen tower cabinet is an exquisite complement to a bathroom vanity. The clear glass of the upper door allows for subtle interior colours to show through creating a delightful tempering effect. Sheffield 24-inch W x 71-1/4-inch H x 20-inch D Bathroom Linen Storage Tower Cabinet in White Showcasing the distinctive styling of the Sheffield line from Wyndham Collection, this transitional Bathroom Linen Storage Tower requires just minimal assembly and makes a perfect fit for any bathroom design. A glass paneled door provides handy storage for towels, perfumes and any other items you'd like to keep visible, while four drawers keep bath essentials and clutter out of sight. Tall, slim and efficient, this space-saving tower offers a small footprint and is easy to place anywhere with its freestanding design. 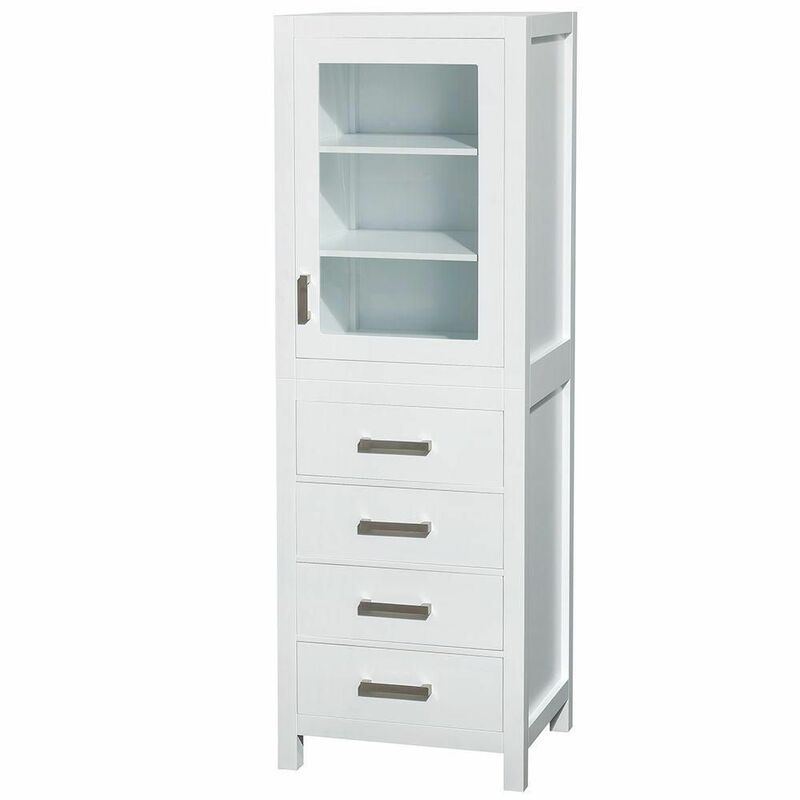 Sheffield 24-inch W x 71-1/4-inch H x 20-inch D Bathroom Linen Storage Tower Cabinet in White is rated 4.6 out of 5 by 18. Rated 5 out of 5 by HomeDepotCustomer from This is a beautiful, well made piece of furniture that... This is a beautiful, well made piece of furniture that added class to our new bathroom. Rated 5 out of 5 by HomeDepotCustomer from This is a beautiful, well made piece. Came mostly... This is a beautiful, well made piece. Came mostly assembled except for the handles on the drawers which were easy to put on. It is a heavy piece though. Bought it for my mother's bathroom and she loves it!! Rated 1 out of 5 by Saumil from Left very bad stains on the carpet while dragging chest... Left very bad stains on the carpet while dragging chest over the stairs. I have also included this as a note on the paperwork. I expect resolution from customer care for this issue. Rated 5 out of 5 by Lindae from Very nice furniture. Solid piece,, assembled, packaged very well. Bought 2 and purchased the vani... Very nice furniture. Solid piece,, assembled, packaged very well. Bought 2 and purchased the vanity also. Rated 5 out of 5 by Kelly from Beautiful piece. Arrived earlier than expected and quality is better... Beautiful piece. Arrived earlier than expected and quality is better than expected. Totally satisfied. Rated 5 out of 5 by JohnS from Beautiful piece of furniture and very well packaged.... Beautiful piece of furniture and very well packaged. Rated 5 out of 5 by JC from Absolutely gorgeous cabinet. Great quality! I can’t wait for my bathroom to be done being remodel... Absolutely gorgeous cabinet. Great quality! I can’t wait for my bathroom to be done being remodeled. I think it’s going to look great! Can the door be installed with left sided hinge , handle on the right? (opposite to the picture).